Overshot is a magical structure. The first time you weave it you can hardly believe the cloth that grows on your loom. Traditionally used to weave bed coverings, overshot has many beautiful applications in today's world, from useful household textiles to breathtaking works of art. This versatile weave is subject to endless variations. Here are a few of our favorite tips and a few truly spectacular projects, too! If you are inspired, come visit us and learn from a master weaver, Joanne Hall. See details below about her workshop. 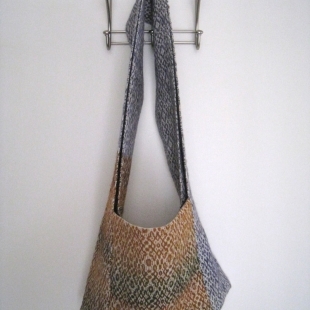 A slouchy bag by FiberMusings on Weavolution pairs leftover BFL singles with sturdy Cottolin to create a fashionable yet functional multi-colored bag. The draft is a design from Ann Weaver's Handweavers Pattern Dictionary, and it's a great way to integrate Overshot techniques while making an eye-catching accessory! 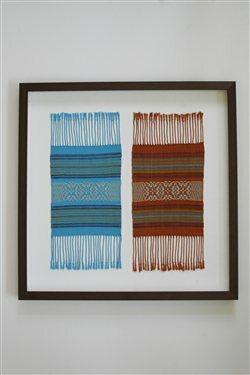 Or, you may choose to elevate your weaving like the work of art it most certainly is, as Evaweave did with her Overshot Study pieces. These two miniature silk rugs look lovely in a frame, don't you think? 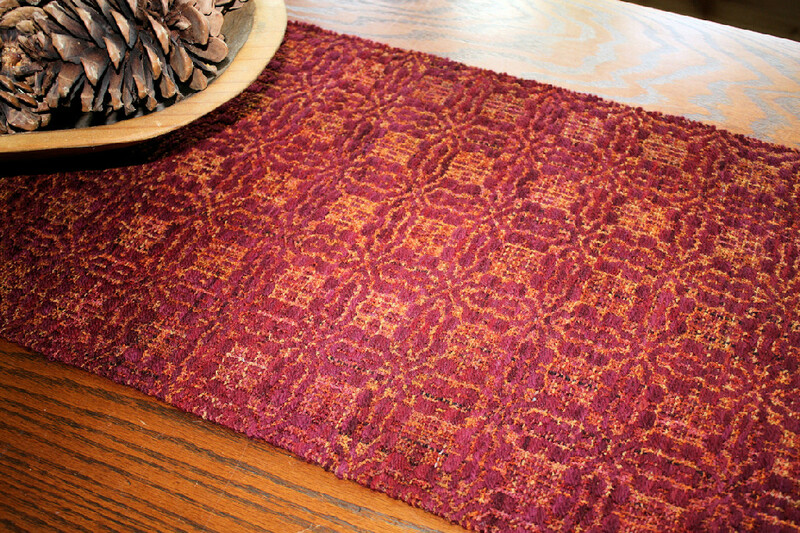 The overshot pattern was adapted from Overshot Weaving by Ellen Lewis Saltzman, complementing one another perfectly. Think overshot is too difficult to try? Deb Essen thinks otherwise! Fiber artist, designer, and teacher, Deb is a passionate weaver who specializes in using overshot name drafts to create "secret messages" in cloth. 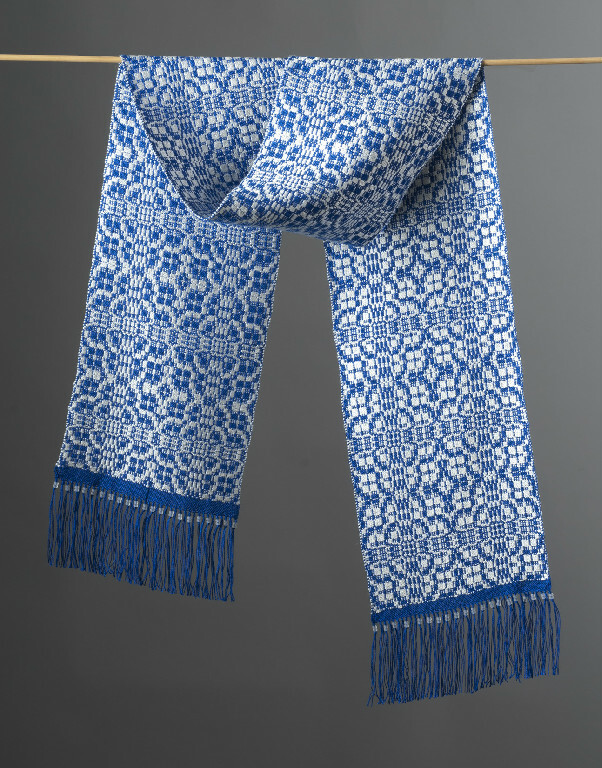 "Weaving is my Passion" overshot name draft scarf kit by dje handwovens. On her website, she explains: "Overshot is a weave structure and a draft is the weaver's guide to creating patterns in cloth. Overshot name drafts assign the letters of a name or phrase to the shafts on a loom, creating a pattern that is unique. The one-of-a-kind patterns become a secret hidden message in the cloth and only those knowing the secret can break the code." Deb lets you in on the secret with her clever kits, each with a hidden message (click here to view more overshot kits on the dje handwovens website). We're particularly fond of her That's Doable kit, which features Mountain Colors hand-painted yarns and, as the name would imply, is our first choice for those new to overshot weaving. "That's Doable" overshaft name draft scarf or runner kit by dje handwovens.